The 15 national motocross championships that participate in Yamaha’s YZ125 bLU cRU Cup program have come to a close. After an exhilarating season of national level racing, 34 of Europe’s fastest YZ125 racing teenagers have earned themselves a place on the gate at the YZ125 bLU cRU Cup SuperFinale, which will take place at the biggest and most prestigious event of the year – the Monster Energy FIM Motocross of Nations – this weekend, September 30th & October 1st. Taking place at one of the most spectacular motocross tracks in the world, Matterley Basin – situated in Winchester, England – 34 of Europe’s most talented YZ125 racing teenagers will go head-to-head for an invitation to the bLU cRU Master Class. The top-three, plus two wild-cards, will be invited to the bLU cRU Master Class at the end of October where they will have a chance at becoming an Official Yamaha rider in 2018. The bLU cRU Master Class is a three-day event and will be run by two highly acclaimed bLU cRU ambassadors. It is designed to inspire and educate young aspiring motocross riders by offering them exclusive knowledge, insight and training tips from some their heroes. Of the eight finalists that make it to the bLU cRU Master Class, one promising rider that has proven he has the desire, talent and attitude to be something great will be selected as the 2017 YZ125 bLU cRU Cup winner. He will be rewarded with a professional contract and a place on the MJC Yamaha Official EMX125 team where he will race the 2018 EMX125 Championship on a GYTR kitted YZ125. Coming back for seconds, Sweden’s Arvid Lüning and Holland’s Jeroen Bussink will be back on the grid again after competing in the YZ125 bLU cRU Cup last year. Both riders made the top-6 in the 2016 edition, which was won by Lüning’s compatriot Tim Edberg. Tim Edberg’s speed, skill, commitment and enthusiasm won him a fully backed ride in the world’s premier amateur series, the EMX125 Championship. 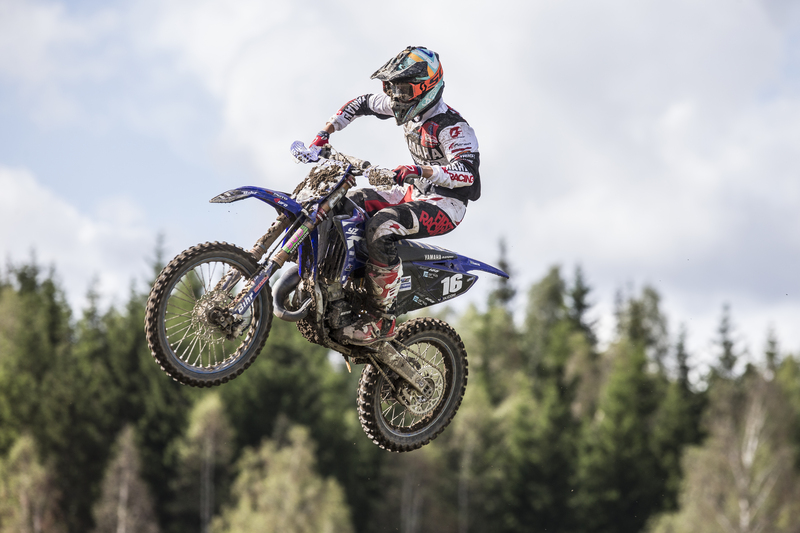 He was placed on the MJC Yamaha Official EMX125 team and thanks to the full support and guidance of Yamaha’s bLU cRU program, the young Swede made a strong transition from national level racing to the world stage. He had break-out performance at the opening round of the EMX125 championship – which took place in April this year at the historic sand circuit of Valkenswaard in The Netherlands – where he turned heads with his awe-inspiring ride from outside the top-ten and into second place on his EMX125 debut. Unfortunately, the second race didn’t go as smoothly as he fell and broke his thumb, but still recovered for a gritty seventh place to finish fourth overall at the season opener – which was his best result of the season. While recovering from his thumb injury for the majority of the season, he managed to finish eighth overall, but definitely proved his promise. He has taken another step forward and has been awarded a place inside the EMX250 Championship in 2018.